Featuring Waldorf-style illustrations and depictions of families of all shapes, sizes and colors, this book gets kids talking about their own families while opening their eyes to the fact that even though families don't always look the same, they all share one special thing: love. 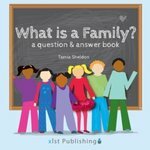 Sheldon, Tamia, "What is a Family? A Question & Answer Book" (2013). DIVerse Families. 226.